Quickly wedge, slice, or halve fruits and vegetables of your choice, using interchangeable blade cups and plungers! This easy-to-use sectionizer, for commercial or home use, gives you uniform cuts, eliminates waste, and saves you preparation time. 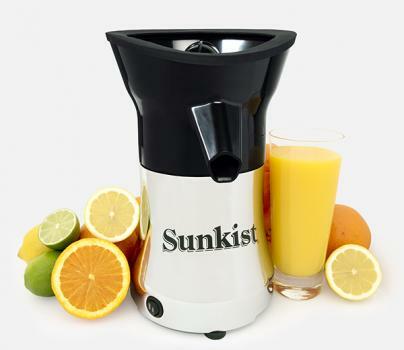 Specifically designed for citrus fruits, the variety of Sunkist Juicers provide your business or home with fresh squeezed juice for every occasion! 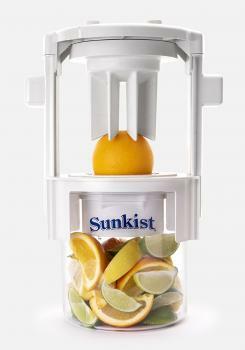 Designed to work with a wide variety of fruits and vegetables, the uniquely designed Sunkist Sectionizers provide unlimited options to streamline food preparation! Designed for commercial use, this heavy-duty 31 pound Commercial Series Juicer endures extended daily use with ease! 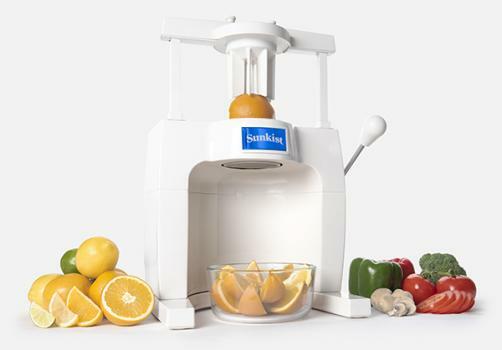 Its high-powered operator can easily extract 20 gallons of delicious citrus fruit juice per hour, when using pre-cut fruit. The metal oscillating strainer ensures that you get the maximum amount of juice out of each and every piece of fruit. The juicer utilizes the same quiet, yet high-powered, motor design that we have been using for over 20 years. 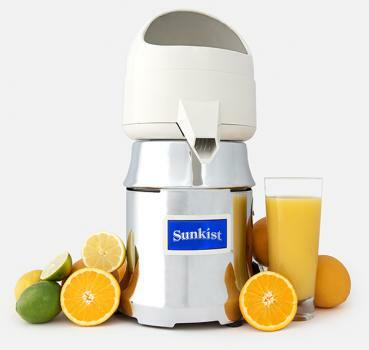 With its compact, space-saving size, the Pro Series Juicer provides the quality and speed that you’ve come to associate with the Sunkist brand, with the added benefit of portability. The powerful engine is designed to extract up to 10 gallons of fresh and delicious citrus juice per hour, due to its heavy-duty, high torque, direct-drive motor. The Pro Series Sectionizer was developed to fit the needs of establishments that do not have the space in their prep areas for large tabletop appliances. Its unique design allows you to easily halve, wedge, or slice any fruit or vegetable that does not have a pit, is firm, and not larger than the diameter of the blade cup. It’s light, four pound weight ensures portability, allowing you to move the sectionizer from the kitchen to the bar with ease. A must-have for any restaurant owner, the Commercial Series Sectionizer allows bartenders to easily create unique mixology creations, and aids chefs in the preparation of fresh fruit or vegetables. You simply insert either your whole or cut-to-fit fruit or vegetable into the blade cup, then push down on the handle and watch your cut produce fall conveniently into the container below. It is the food preparation solution that you have been looking for! Perfect for any high-traffic business, such as schools, hospitals, or amusement parks, the powerful Auto-90 Industrial Sectionizer is the automated version of our tabletop Sectionizers. It has the ability to halve, wedge, or slice up to 90 pieces of fruit or vegetables per minute. You only have to insert your fruit or vegetables into the blade cups, and then watch them be seamlessly and quickly cut into uniform pieces. Designed to be inserted into a single piece of whole citrus fruit, such as a lemon, lime, orange, or grapefruit, the lightweight Citrus Mister easily and quickly extracts all of the fresh, natural juice from the fruit. Once the juice is extracted, this revolutionary cooking tool allows you to easily spray the juice onto food, or in beverages, to easily customize flavors.